Intramurals: This will be offered to 4th and 5th grade boys and girls. Intramurals will be every Thursday after returning from winter break. We will continue our learning and skill building of basketball and compete in a final game against Garfield elementary at the finish of our season. Jump rope for hearts: This is a school wide and family event where we try our best to raise money for the American heart association. We are currently trying to beat our last year fundraiser of 2,000.00 dollars. We will kick off the event with a school assembly on February 14th at 930 and 1000. Girls on the run: This will begin mid-February and be offered to all 3-5 girls. 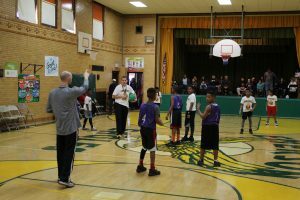 This will take place two days out of the week and we will teach a new lesson daily based on sportsmanship, teamwork, life skills, and finish with endurance training while preparing for a 5k marathon run in Chicago.